Flare Magazine is one of Canada’s top fashion magazine. 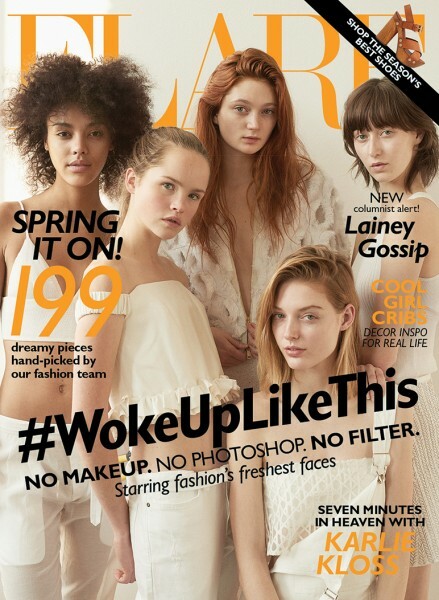 The March 2015 issue was unveiled and features a cover with five fresh faced models wearing no makeup and absolutely no photoshop was used on the final image. The young women are some of Canada’s next up and coming models (Sasha Hronis, Charlotte Mingay, Sophie Touchet, Shelby Furber and Jenna Lenfesty-Castilloux). This isn’t the first time that a magazine has dived into the idea of using no photoshop on it’s cover. I remember a few years ago when Jessica Simpson appeared Marie Claire magazine’s May 2010 cover without any makeup or photo retouching. It’s quite refreshing to see people represent the face of beauty without any cosmetics or digital altering. This is one instance when you can really say they woke up like this #flawless. Emma Stone is on the cover of the May 2015 issue of Interview Magazine! What’s more? Diane Keaton is the interviewer! The article is wonderful. It’s almost as though you’re eavesdropping on the two having coffee. The images are shot by one of my personal favorites, British fashion photog Craig McDean. Harkening back to 70’s editorials, the photos are deliciously grainy with a muted palette, except, of course, for that vibrant red hair by Tracey Cunningham! You can read the article in its entirety on the Interview Magazine website! WHY THE ELLE IS BREASTFEEDING TABOO? If breastfeeding is taboo then eating a burger in the street needs to be taboo to the power of 100! Supermodel, Nicole Trunfio posed and simultaneously breastfed her son for the front cover of Elle magazine Australia – what a talent! Breastfeeding and look hot whilst doing it, kudos to your girl! Candice Huffine–who you might remember as the first plus size model to be featured in the Pirelli calendar–is launching a plus-size line with Italian brand Elena Mirò this week called #LovedByCandice. Unlike so many collections catering to diverse sizes, this one features clothes style-minded women will actually want to wear–and that’s cause to celebrate. The seven-piece range is refreshingly on point, and includes pieces like a plunging black LBD, lace-up tops, brightly-printed minis, and other trend-focused items. In keeping with the line’s fashion-forward feel, the collection was also shot by high-fashion photographer Joshua Jordan, who’s also worked with international editions of Vogue, Elle, and Harper’s Bazaar. Although the line won’t launch online until later this week–patience, you guys!–you can find out more about it here. In the meantime, keep scrolling to check out pieces below.